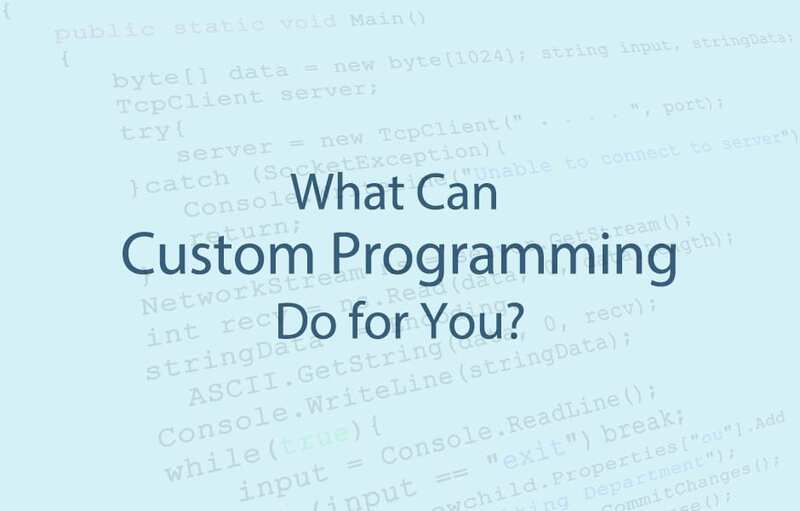 What Can Custom Programming Do for Businesses | IT Solutions can provide long-term productivity gains and substantial cost reduction to your bottom line. The benefits of building and owning your own code, often far outweigh the short-term benefits of buying commercial or off-the-shelf products or modules. A custom solution provides your business the ability to continue to customize a solution as future business needs come up. Plus, a natural outcome of any custom programming engagement is a close examination of current workflows, which inevitably leads to improvements as a matter of course. A common objection and misconception to customizing software is that a business has to start from scratch in order to make a solution effective. In many situations, this is not necessary. Existing software or even Excel spreadsheets can often be the basis for a system that can be built, modified, or integrated. This option provides an effective solution for a fraction of the long-term cost associated with commercial systems and their perpetual annual maintenance costs. In the cases where existing systems can’t be re-purposed, a product like Microsoft SharePoint can be used to extract critical data or build a bridge between platforms to improve data analysis and workflow with software that’s already in place. For enterprise and web-based initiatives Microsoft technologies such as .Net and SQL Server is a popular choice. For smaller workgroup and desktop productivity situations, FileMaker is a great, cost- effective solution and offers a mobile platform called FileMaker Go. Salesforce.com is a great option for non-profit organizations as well as companies of all sizes for its customization and integration capabilities with related products. For companies looking to update or completely revamp their internet presence, we partner with local consultants with expertise in products like WordPress and search engine optimization to offer great-looking sites minus the high cost associated with coding from scratch. As you think through your technology goals and initiatives, you should always consider all areas for improvement, including modifications to your current processes and workflow. Much can be achieved through custom programming engagements that yield long term benefits and cost savings. Perhaps even just an evaluation of your existing applications guided by a consultant would be worth some time and effort. You might discover you’re doing just fine with the solutions you have in place. Or, there might be areas where custom could save money and improve productivity in the long run. If you need help improving internal prcoesses and workflows and would like to discuss whether a custom solution is right for your business, fill out the form below, or contact IT Solutions at 1.866.Pick.ITS. So it’s time to examine your technology needs for the months ahead. You’ve done your research and listed out the obvious areas for improvement, such as upgrades to existing hardware and line of business applications. Upgrading your workstations and existing software to include a new module to your accounting software is easy to identify and prove quick returns. What’s less obvious, but equally important to examine, are the benefits from making changes to your current processes and workflow. While this may seem like a large undertaking, improving your workflow through custom application development can provide long-term productivity gains and substantial cost reduction to your bottom line.